I trust you are well and life is full of the good stuff. I think of you so often with gratitude, I hope the good vibes reach you. My ankle is still strong and pain free. I do whatever I like, which this year included the Imana Wild Ride which is incredible. All thanks to you. Every now and again someone asks me about the scar and I remember my ankle facing the wrong way and still can't believe you managed to put it right. My never-ending gratitude is yours. I hope you have fun holiday plans and are taking a well-earned break. A big thank you to you and the entire practice for the excellent and professional service received. From the first consultation to the follow up consultations post surgery, your entire team made it easy to go through the process of obtaining authorisation and going through the actual procedure. This made recovering the easy part. Obtaining Nappi codes and contact details for a physio much appreciated. I just wanted to say thank you for everything. I was super impressed with you and your practice and my foot is way better and pain free. I can now continue to enjoy the things I love. I couldnt believe how quickly I healed too and how comfortable the whole process was. Also your secretaries are lovely. I spoke with Billie and she said that if I am feeling good, then I do not need another check up appointment. I will let you know if anything changes but again thanks for everything. I do and will continue to highly recommend you to anyone I know. Hereby I want to thank you for everything. I am so pleased for all that you have done for me. My foot is already healing very nicely. I can already feel a big difference and trust all will be well in future. I am so glad I got the opportunity to have met you and for your assistance and all you efforts for making sure that all went well. Dear Dr Crane, Thank you for making me so comfortable from the get go. I was so nervous to operate on my foot, but thinking about it now I should have done this 6 years ago. Dr Crane was very thorough in explaining every procedure and his treatment was very proficient. Thank you to all the staff at the hospital, at your office and to you Dr Crane for doing such a wonderful job. I would and have recommended you to numerous friends and family since my operation. Gone is my plantar fasciitis. Hopefully I can run again in the near future, but for now I am taking it easy. I am forever grateful. Take care. I would like to thank you, Dr. Lloyd and your wonderful operating team for the excellent treatment I've received. Would like to thank your administration staff, Lauren and Billie for their professional and emphathetic manner they assisted me as well. As your first time patient, I am truly grateful and extremely happy in the dealings with your consulting and operating style. Right now, I just need to take it easy and cant wait to be back on my feet again. Been a long time, hope you’re keeping very well and knocking okes out in the ring if you’re still boxing. I remain eternally grateful to you for fixing me up as you did. Last year I managed 8 Ultra marathons, including Sky Run 100km in November. This year the madness continues having completed the Addo 100 miler in March, 161km’s of brutal trail through the Addo Elephant Park, 30 hours non-stop. Tripped balls from about 130km’s to the end but it was awesome. Then smashed Oceans Ultra a month later, then West Coast Marathon a few weeks after that. Comrades coming up in June, Puffer in August, Karkloof 100 miler in September and then UTCT 100km in December. You basically made me bionic and I’m bloody grateful. Thanks again. So now the favour part. My running buddy and I are planning to start a Youtube channel about our running vibes. I’m scripting up the first series and was hoping that you would be willing to star in it? Jedi treatment of my ankle.If you’re keen and willing I’ll book an appointment and then give you more detail in terms of script and what to expect ahead of our meeting. I hope it’s not too cheeky of me to ask, let me know if you’re willing to make your hollywood debut. I had been recently admitted at your hospital and I wish to thank all of the staff from reception, I would like to mention Elretha and the other lady. The 22nd February 2018 I was admitted, and it had been overall a very joyful stay. The teamwelcomed me, treated me beautifully, and they did their outmost best. The staff in the ward area, whilst I was awaiting to go to theatre, we brilliant. The male night nurse(forgot his name)from Durban originally, was so excellent, kind, ever smiling as well as the other nurses. The treatment I received was so overwhelming and on point. I had a very good stay at your hospital and I will certainly recommend my family and friends. The most outstanding experience was with my doctor J Crane, his treatment was very proficient, he was thorough in explaining every procedure and overall satisfactory. I don't recall any bad experience at all, even though I did not stay long. Lastly, Not forgetting the ladiesat theatre who comforted and thoroughly explained the entire process. Thank you for your help in fixing my ankle and getting my toes back in working order! It’s hard to imagine how I had been battling with my ankle and toes since breaking my ankle in March of 2016, with the previous doctor not getting to the results I needed. Your approach to accurately diagnosing the issue and manner in which you discussed the procedure made comfortable and confident that you were going to be able to bring me the relief and results I was looking for. I would also like to thank you again for accommodating me with the remaining account and really do appreciate this!! Dr Crane is both a great surgeon, and a great guy! He keeps good company too, from his super efficient and friendly support staff at his practising room, Billy and Lauren, to his wonderful surgery team, Dr Dorfman and Anaesthetist, Dr Verbeek. I couldn’t have hoped for a nicer more caring doctor and team. I honestly can’t recommend Dr Jason Crane highly enough. Hope you are very well. Thought I had to share the news with you that I ran the 10km Gunrun yesterday. Almost 2 years after you filled my toe with titanium, I started running 3 months ago. This race felt like such an amazing moment for me and I really wanted to let you know how hugely grateful I am to you, it feels quite miraculous 😁! It's eight weeks since surgery on my foot and wrist and time for me to write and thank you for your professionalism throughout. From the very first communication with your rooms, I experienced nothing but friendly efficiency from Lauren and Billie. Your quick response to my calls and many questions was greatly appreciated as I debated the uncertain. I have never encountered a pre-surgery hygiene routine and was reassured by this precaution against infection. The nursing day staff of Cape Town Medi-Clinic were of a high standard and your recovery instructions and brilliant post-op shoe aided a successful healing process. Yesterday I visited my Podiatrist and he was surprised to hear that the surgery was recent as the scar and movement is way beyond expected recovery. He further added that the positioning of the big toe was spot-on. I'd like to thank you for being approachable on your rate and I can definitely recommend you as an excellent, efficient yet friendly orthopaedic surgeon. I remember so clearly the day you first looked at the x rays of my foot and equably exclaimed that my foot was a mess. Well, since I am a ‘not-beating-around-the-bush’ sort of person, I immediately felt reassured and from the word go, felt my foot was, literally, in good hands! You reassured me in October that I would be able to climb Mount Everest in June, and although I have no intentions of doing this right now as I have many other ‘mountains’ to climb, I feel that I would be able to consider this very definitely. Moreover, the other mountains have become so much more climbable now that I am more than less fully recovered and totally pain free. I appreciated the fact that you always listened to and answered with much care the many lists of questions I kept coming up with. In hindsight I make no apology for this because I know that my incredible recovery was largely due to this exchange. But even more, I really appreciated the fact that you never made me feel that I was being paranoid or over cautious, and that you supported my decision not to rush my recovery. It is now six months since you did the operation, and I can truly say that I am back on my feet with a spring in my step. At odd moments I become aware of the fact that my gait is not only ‘normal’ but also totally pain free, something I could not have imagined six months ago. I have learned a great deal about my foot and feet in general, and have come to appreciate the complexity of the structure of our feet and therefore the intricate nature of your ‘artistry’. Thank you for your consistent expertise and also for honouring so tangibly the role of the teacher. I felt incredibly supported on all levels and at all times. I trust my mail finds you well. Just thought I'd let you know that my leg and ankle are doing very well. So well that I have done my first hike up Devils Peak yesterday. You will be happy to know that I am also back at my Indian dancing classes and hope to perform later this year. Thank you for all that you have done and for giving meaning back to my life. I just wanted to say THANK YOU from the bottom of my heart. I feel so helpless, but with your guidance and with Andre doing the physio I feel better each day. Hoping we have to have no more operations and looking foward to being able to stand in June on two legs. Your positive energy you give our family is really comforting and again from Razia and myself THANK YOU. Now please have a great fight on Friday and may it all go well (I won’t use the show biz quote - Break a leg). Ran a 3hr 58min Peninsula Marathon on Sunday less than 5 months after surgery. As a thank you (pitiful as it might be) to Dr Crane, I named a puppy "Jason". He came in as unwanted at about 5 weeks and stayed with us for about a month. 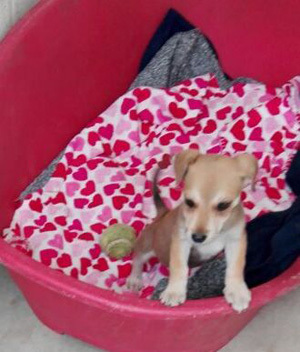 Luckily because he was very cute, he was adopted last week. 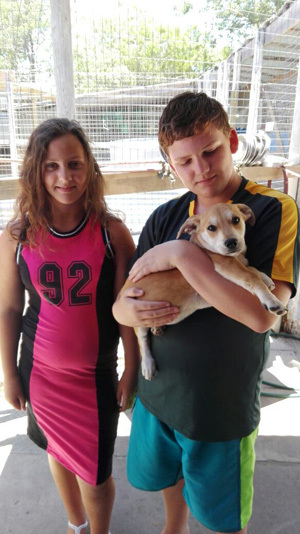 So little Jason has found a good home with a family that love him very much already. I have attached a photo of when he came in and of the day he went home. I hope it give Dr Crane a bit of a smile. Thanks once again for all the care and kindness. The race was on Saturday and same as last year, it was the best day. The original plan was to race but after the fall the goal was to have fun and finish in one piece. 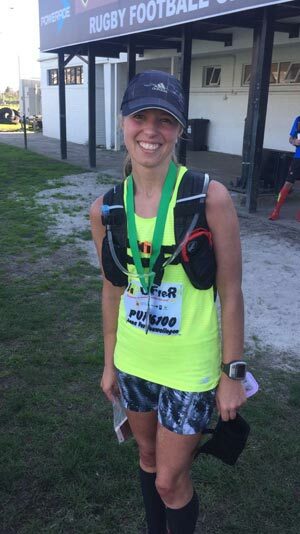 But I started racing from Constantia Nek because I felt amazing/strong and for the first time in two months had minimum fear, and ended up being sixth lady again. The route was slightly different; my time was eight minutes slower than last year. Thank you for fixing up my wrist so nicely and in time for me to have another great PUFfeR. Finish photo attached. My main running talent is that I hardly ever look tired. I was. [Dr Crane] has been the first Doctor to ever listen to me completely without jumping all over the show. I have been to countless doctors and Dr Crane is the only one to have ever picked this up. I actually started crying from relief and happiness after I heard his voicemail yesterday afternoon because it’s the first time I’ve ever received an answer on what’s wrong :) and it was something so simple! Dr Jason Crane, Terugvoering na die frats ongeluk en huidige herstel van my voet. Op 19 Desember 2015 het teels op my regter voet geval en al die tendons afgesny. Ek is verwys na Dr Jason, en so bevoorreg en gelukkig om deur die beste sjirurg behandel te word. Vandag amper 6 maande later, stap en draf ek normaal. Kan hom nooit genoeg dank vir sy uitstekende diens en behandeling. Nogmaals baie dankie Dr Jason. Terugvoer na operasie van 6 weke gelede. Na 13 jaar slaap ek weer sonder pyn en dra toe skoene en stap heeldag by die werk. Na 13 jaar van dokters besoeke en pille drink, waar ek begin dink het ek verbeel my of sit aan van die pyn in my enkel kan ek weer n normale lewe begin ly. Hiermee wil ek net baie dankie se dat jy bereid was om my te help. Waardeer dit. Just a quick update. Thank you for allowing me to play in our Club Champs. As I had not played for six weeks prior to the week before, I had no expectations, just happy to be on the course again. 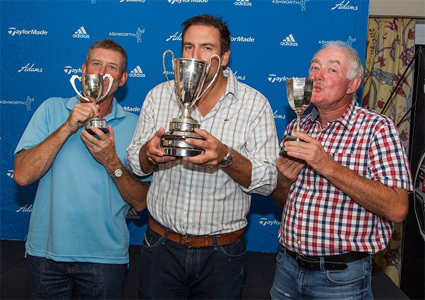 Club champs is played over two weekends, i.e. four rounds of medal. To my own surprise, I had two good rounds and managed to hold onto my lead and win the C division. I feel that I could start a little work on my stationary bike, without standing. Maybe I could walk 30 mins every other day. Happy to hear any other advice you can give. 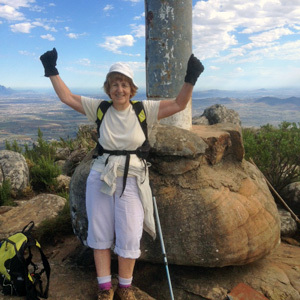 Today I achieved my goal of once again climbing to the top of the Helderberg at 1000m.This is the first time I have done it since you operated on both feet, so I am feeling especially chuffed. Thanks to you for fixing my feet so I have been able to carry on and extend my hiking life. Not bad for an old lady just two months short of 80, is it? I apologise for not mailing you earlier. I just want to thank you for the kind and efficient service from you and your team when you operated on De la Rey. He returned home on Saturday evening and it is fantastic to see him walking short distances already. As a parent at a distance one is going to be more concerned because you cannot do much to support your child so the quality of service that De la Rey received went a long way to reduce our general stress. From your preparedness to mail us the options right at the beginning to the aftercare at his last consultation we could not have wished for more. It was good to see you again a couple of days ago. I just want to thank you for being so kind to me. Nothing is too much for you, even helping me put on my shoes!!!! Thank you for having performed a successful hip replacement operation on me. Thank you for understanding my circumstances, even more so when my husband passed away recently. You have been so generous and I want you to know that you are just so special and that I appreciate your kindness and everything that you have done for me!! I wish you every success and many blessings in the future. I trust that anyone seeking for a hip surgeon will feel assured, after reading this letter, that you are the person he/she should contact. You, the reader of this letter will not be sorry if you choose Dr Crane to perform your surgery. In fact you will be elated once you can walk again without pain!!!! I was truly fortunate to be in the literal and metaphorical hands of such a renowned and talented expert — a surgeon who matches experience, knowledge and insight with care, approachability and humanity. I so appreciate all that you have done for me and my (soon to be dancing in heels) foot! I wish you and your family all blessings in the festive season and the new year to come. You did a knee replacement on me last year 2nd June. I am very grateful to you, I can walk without a limp and I am completely free of pain. I would like to thank you for giving me a new lease on life. I thought it would be only fitting of me to send you a follow up mail of my experience at the Orthopaedic section, (ward F01), of the Mediclinic hospital in Gardens, Cape Town. I was admitted on Sunday 31 May 2015 and my operation performed by Dr Jason Crane on 1 June 2015. I was discharged on the afternoon of Friday 5 June. I believe my stay was long enough to be able to assess the full extent of the level of service experienced from all the staff and doctors who attended to me during my stay at the hospital. I believe you should be very proud of your team. The care, attention to detail, general level of service and professionalism that I experienced was of the highest standard and thus was the reason which prompted me to send this mail to you. I would appreciate it if you could pass on my feedback to your team. I cannot contain my joy and I just have to share it with you. This morning the boss phoned so as to inquire how my recovery is doing and whether I will be able to fly this weekend cause they could have a big job where they need both helicopters and they are short of a captain - the job is to take 57 guys of a ship that will be 7 miles west of Green Point at first light on Saturday. Although still on crutches I went to work. When I got there it just happened to be that today my colleagues were getting ready to do their recurrency cargo-sling flights because Saturday’s job might also include cargo-slinging. (cargo-sling is when you carry cargo on a hook under the belly of a helicopter. By means of a switch on the flying controls one can release the cargo when you reach the destination.) 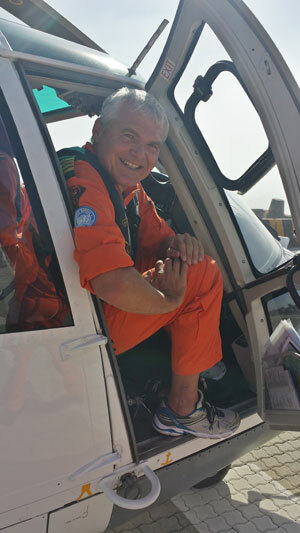 I promptly included myself into the training and so today I was in the cockpit flying, less than 8 weeks after my op. Now all I can hope for is for Saturday's job to come off and I will be "back in the saddle". Arriving home elated, I had to do something to “calm down” and cause it was too late to drive to the cable station and cycle from there, I cycled from my house in Devils Peak (still normal running shoes cause I can't "click-OUT" yet) and managed to reach the old blockhouse in one go. I attach 2 photos to prove what I have written is 100% true and I give you my word they are NOT Photoshoped. I had an xray 10 months post op and 6 months post noticing that there wasn't 100% bone fusion with my medial malleolus and I'm glad to report that it looks like there has been 100% fusion now. There is still some swelling and stiffness but I'm sure that comes with getting the ligaments and muscles stretching to what they did before. I just wanted to say thank you for your skills and I managed to play my first game of touch rugby yesterday in a year! I will keep strengthening it with the goal of playing social soccer sometime in the future. Whilst I won't be attending any World Cups I will have the opportunity to kick a ball around with friends and if so be, my own children one day which is PRICELESS! I have attached two documents, one showing delayed union and the other my latest xray for your interest. It has been on my mind recently to write and express my thanks to you following the series of operations on my bunion-ed foot. Whilst the initial operation itself was not a success, and the subsequent efforts to save the toe failed to have a positive outcome, the final decision to amputate the toe was the correct one, and it worked very well. The wound healed quickly and I was back on my feet and in normal shoes very quickly. That foot now performs better than the left one, and, No, you may not operate on that one! Just to let you know that I had my spur removed on 31 March last year and have fully recovered. 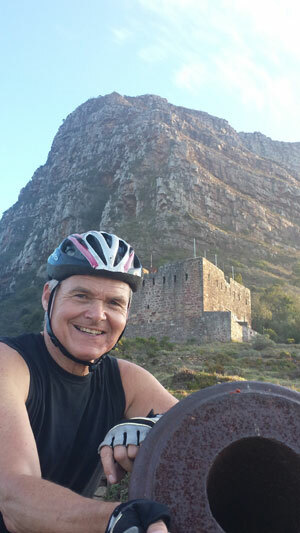 I did the Cycle tour on 8th March, although reduced, but have trained for the full one. On the 10th March started running 3 km, thereafter incrementing till 15km in a 21 day training period. 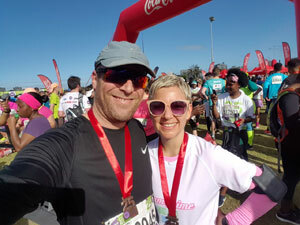 I ran the 21 km Two Oceans half marathon last Saturday. I did the ultra marathon 14 years ago and never ran since due to an ACL knee op done a few months afterwards in 2001. I feel like a walking miracle. Thanks for the new lease of physical health you've given to me. What can I say... except that my recent consultaion and surgery to my right knee has left me feeling that I have been treated by the best, I appreciated your full discussions regarding treatment options. Your quiet calm manner, with a very noticeable dry sense of humour and your over all interest in my well being. Your receptionists are calm, professional and efficient. In fact I can honestly say that my whole experience with yourself, your receptionists and the Cape Town Medi Clinic was most amazing. I left following my surgery feeling confident about my recovery and would absolutely have no hesitation in recommending you, should anyone I know need to consult an Orthopaedic Surgeon. Cape Town Medi Clinic will definitely get 10/10 from me. I recently had hip replacement surgery at your beautiful hospital. Dr Jason Crane performed the operation with his able "A Team". It was such a pleasure to be treated and aided by caring doctors, sisters, nurses, physiotherapist and of course your kitchen staff, who made meal times a joy. Thank you all, my hip is great, and I had such a lovely holiday! Hope you are well in lovely Cape Town. All still well and prosperous here in London. It's now over 5 years on and I'd like to once again thank you for the great work you did on my knee. I no longer feel any discomfort whatsoever and live life to the full!!! I've been skiing in the Alps every year now with no braces or support and also finished the London marathon last year. My time was a meagre 5:10 due to suffering ITB friction syndrome in the side of my knee (the one we fixed) during my long run training and I had to get cortizone treatment and a local anesthetic injection in the knee on the morning of the race just to be able to start. I managed to battle through though and finished with everything in my body hurting EXCEPT the knee that got jabbed that morning. My girlfriend and I managed to however raise just over £4000 for CLIC Sargent, a children's cancer charity. I did quite a bit of damage during the race as predicted by the doctors but after 6 months I could get back to running. I wanted to send you a note to say thank you so much for such great service. As you know, we have only ever seen Maahera walk on her toes. It was something I never thought would change until you suggested the operation on her. I had always thought it was a habit rather than a physical difficulty which you so promptly pointed out. Since the boots have come off, I am amazed to see my child walk normally for the first time in 9 years. Her toes which were always clawed and bent have also straightened out since the surgery - something which I find miraculous since we always teased her about her toes. I cannot thank you and your staff enough for your fantastic etiquette, your compassion and meticulous manner in which you conducted all examinations and above all your prompt responses after hours to address my concerns. I would like to take this opportunity to thank you so much for your assistance with my son's fractured wrist. As you know we were holidaying in Cape Town when David returned from camp with a fractured wrist. It is never easy to sort these problems out in a city where you are a visitor as well as over the December holidays. Fortune smiled on us when we bumped into Lauren in the parking lot. She went out of her way to explain what we should do and managed to squeeze us in for an emergency appointment the same day so that a waterproof cast could be fitted. It is always a real pleasure to come across such friendly and helpful people and your "going the extra mile" made a huge difference to our holiday. Wishing you all the very best for 2015. This is a small note to express my gratitude and appreciation for the experience I have regarding my surgery and your practice. Three knee operations over a period of four years using "different" Orthopaedic Surgeons only to finally meet the Doctor whom has brought relieve and hope to my life. 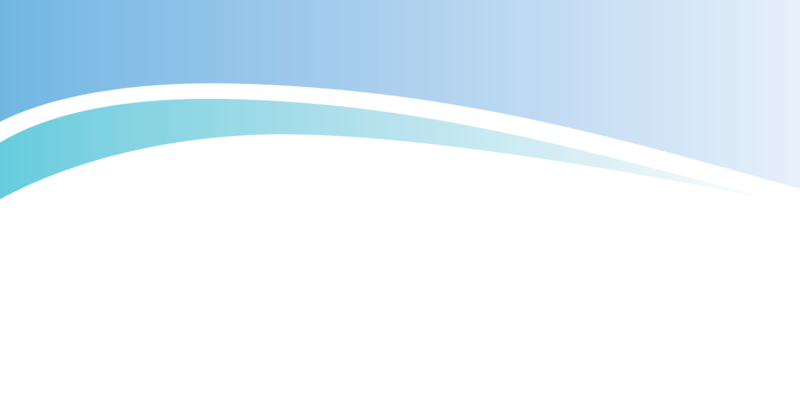 What an amazing experience, Dr.Crane's friendly smile and professional environment set the foundation for what I believe and feel has been a good experience. He made me feel as if I was his only patient for the day. I found him to be competent, thorough but yet gentle with his examination and asked many questions. I have found DR. Crane to have good bed side manners which was not the case in previous experiences of Doctors /Surgeons. He then gave me my options and in detail explained the possible outcome. I then decided to go for an "MRI Scan". After he viewed the scan he advised that an operation would be an option or rehab and strengthening. I advised him that I would go the route of the operation as I have been suffering for over 10 years of which I could not even run 10 metres for the past 3 years without feeling any pain. Pre-Operation as I was laying in the waiting room in theatre, he checked in with me and was detailed, direct and positive with me. This was reassuring to have him perform the surgery and brought calmness and positivity to me. Post operation, you came to my room as I awoke but because I was still heavily sedated you advised me that you would rather see me in the morning. Bright and early the next day u were by my bedside and took me through, the detail of the operation. Even though this was an intense procedure you again were very positive of the outcome. Once again making me feel exceptionally positive!!! Not forgetting your staff, I felt the warmth as I entered your practice. Your staff are kind, efficient but not rushed which made me feel as a person rather than just a number. I observed their interaction with other patients as well, they demonstrated the perfect combination of professionalism and compassion in a way that stood out from my other experiences. DR.Crane, I appreciate and value the manner in which you handled not only my case but more importantly me as a person. To you this may have been a regular day and in the line of duty, to me you the above average person and surgeon, well suited for this profession. I thank you! Thank You! Thank you!!!!! I would like thank you again for the excellent job you did on my severed Achilles Tendon. Even though I was back to my life-guarding, running and soccer after a couple of months after my procedure. The real test came this past weekend when was able to do a trail run up to Devils Peak run down and then up to Maclear's Beacon on Table Mountain via Platterkip Gorge and run down without experiencing any Achilles pain or discomfort during the feat and also in my post recovery. I'm eternally indebted and grateful to you for giving "my life back" and will continually recommend your services to others. able to play sport again and dance. Thank you for looking after and treating my little princess with such love. We would like to "Thank You" for everything you have done for me to be walking pain free again. My heartfelt thanks to Dr Crane for operating on Thabit’s knee and helping him so much in getting the operation done. that Thabit has his operation. Also a big thank you to Lauren and Billie for your outstanding service you provided and for caring so much about the patients. authorise the operation. The amount of time and phone calls it took, and you never gave up!! I would just like to say Thank you for the bilateral bunionectomy you performed on me in January this year. I am almost 3 months post op. I have had no pain whatsoever since day 5 of my surgery, and even then, it was more of a mild discomfort than pain. I really appreciated that you took the time to discuss the best course of action, with me. it made me feel more involved in the process. I have seen numerous orthopaedic surgeons before I decided on your practice. I feel that you are genuinely passionate about what you do and I just knew I was in the best hands possible - I was right! The results are amazing. Thank you again... the procedure has had such a positive impact on my life, it feels great to enjoy a morning jog without any pain. Martin is at home this morning. Big Yay!! I would just like to thank EVERYONE involved for the amazing service we’ve experienced. All the friendly faces and especially Dr. Crane who did what he does best! We are grateful beyond words and my man can focus now on healing and recovery. We will still be in contact as he needs follow up consultations, until then..
Have an awesome Friday and even better weekend! I have been so worried about my mom's knee since I left South Africa. She has been going back and forth on a knee replacement, but has finally decided against it because she doesn't have that much pain, just an ache the past few months once the injection starts to wear off. But mostly because she has no-one to look after her. She emailed me as soon as she returned from you today to tell me that she not only feels great, but that you were very sweet to her, and also MORE than undercharged. That was so kind of you - and it's not just the money, but it reminds my mom of her father - the small group of doctors and surgeons who still care about their patients, and don't operate their practice on a conveyor belt system. No wonder you are the best-rated doctor on the internet in your field in SA. As an advertising (wo)man, it's rare to see advertising that is actually true! Ha! So I wanted to reach out, and just say a big thank you. You have been very kind, and really touched us both. And as a daughter who feels helpless by being so far away, I thank you for making her safe and in good hands. 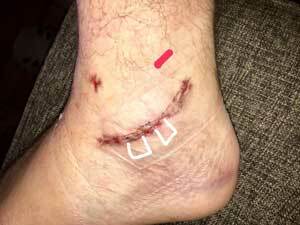 You operated on my foot about a year ago – a sub-talar fusion to fix an injury I had been carrying for over 30 years. I just wanted to let you know that I’ve just hiked the Otter, and that my foot felt completely marvellous every step of the way. It was the most incredibly enjoyable experience, and the first multi-day hike I’ve ever done that wasn’t excruciating by the end of every day – you have literally changed my life – thank you thank you thank you!!!! Wow, Lauren… I do not know how to thank you!!!! Once again, thank you for everything – please thank dr Crane as well. This entire experience (well, taking into consideration that I was in hospital), has by far been the most professional and efficient scenario of it’s type that I have ever encountered. Thank you once again. You are an amazing team!!!!!! I tried to contact you shortly after you discharged me from hospital. According to your telephone answering machine you were out of the country and would only be back on 4 June 2013. Good for you!! I sincerely hope you spoilt yourself with a few days in the sun. I am not the expert but the last time I saw you I thought you were badly in need of it. Doc I am a happy man and and I wanted to share it with you. I thank the Lord daily for people like you, people who unselfishly help others to get back on the road to better health and in my case back to physical normality, wel as far as it is possible for a man of 68. I honestly appreciate the professional, but also friendly and straight-forward manner in which you conduct yourself. In your absence I contacted the physiotherapist named Andre, the one you introduced me to earlier, in order to ascertain whether I should take the “Moonboot” off at night when going to bed He confirmed what I was thinking namely that I need not sleep with it on the foot. Since then I saw my house doctor and his partner to have dressings changed and clips(stitches) removed and not only were they happy with the general condition of the ankle but also with me taking the boot off at night. Please let me know if you differ from them. At this stage of my life having had to cope with pain daily for the past three years, it has become very difficult to say whether I experience more or less pain now that I have been operated upon. I think it’s much less but then again the true test would surely be on the day I say good bye to the crutches and finally the day when I donate the ‘Moonboot” to some or other worthy institution. The only pain that is worth mentioning is on the left-top of the ankle (feels like a tiny bony growth under the skin) and then on the right side of ankle more or less where you broke the bone and then I only experience this pain when wearing the boot. Please let me know if you think I should ask someone in my area to have a look at it and report to you, should I have xrays taken or should I come and see you in Town ?????? The latter would of course please me a lot but then it would be be much more expensive. Maybe a personal telephonic conversation with you would suffice, if so, please let me know when it would suit you. Otherwise you could phone me whenever you like, seeing that you have done such a good job in keeping me at home!!!!!! I'm sure that you hear thanks from patients all the time, but I hope that this does not detract from the magnitude of the gratitude that I feel to you and your team. As an earlier diagnosis had left me with little hope, I was delighted that you saw a fulfilling future for me doing what I love most, exploring Table Mountain. When I needed the treatment sooner rather than later you were able to accommodate me straight away. The hospital was excellent, and every member of staff that I encountered was exceptionally professional and helpful. I felt at ease, and in safe hands even as I fell asleep on the anaesthetists table. It is only two days later now, and I am still in pain, but it is now of a different sort - the good pain of healing. I can remember being overjoyed when I awoke and you explained to me the procedures that you had done and how successful they had been. I am still grinning with pleasure. You did my ACL recon in Cape Town in Oct 2009. Would like to report back long term that all is still good and strong. I would only sometimes on skiing trip feel a strained painful sensation behind kneecap while sitting down, not in action. But probably just normal strain after hard day of skiing. Thanks again for a great job of fixing the mess that I made if my knee. It has been about 2 months now since the knee operation and my knee is almost healed properly. I have this operation done before but I didn't feel this great afterwards. I want to thank you as you actually listened to me during the pre-op visits, you made me feel very comfortable with choosing you as my surgeon and for actually caring. You even came to see me after my surgery which my previous surgeon did not. I could walk with a crutch when I left the hospital where as with my previous operation it hurt too much to walk. You really are a great surgeon and when I hear of anyone who might need services of an orthopedic surgeon I am sending them your way. Your staff are also very friendly and helpful. Now I just have to work on getting that muscle back in to shape along with the rest of me and everything will be normal as it should be. I have been meaning to send this mail to you as an indication of my most sincere gratitude in how you have dealt with me and treated me pre-, during and Post Operation on my Ankle reconstruction. Please believe me that I was extremely weary of having this operation, hence me choosing not to have this done 2 years ago when the problems first started. I had heard that Ankle operations leave a person out of action for 6 months post op and then again for another 6 months after the screws are removed. I have personally seen people on crutches for over 6 months after an Ankle injury where surgery was required. I could not think of being inactive for so long post op, which was another reason for delaying my corrective surgery for over 2 years. I did my research and saw the testimonials from many happy patients, so chose to make an appointment and take it from there. My recovery has been really fast. I suppose that no one wants to go through months of recovery, but I have returned to my Bicycle and done some long slow rides of over 60kms on consecutive days before my 2 months post op date was there. Dade cannot believe that I am recovering so quick. He keeps on telling me that people spend up to 6 months having physiotherapy to rehabilitate after ankle surgery. I am not even 2 months after the op, and cycling over 60kms a day. In all honesty, I am really really appreciative of the way this surgery has gone as well as the kind, easy, down to earth demeanour you had with me. You made me feel comfortable all the way on this journey. I am very pleased to let you know that – thanks to you – I did walk all over the south of Italy and now in Rome. Just as I intended, no complaints from my feet/toes.... but from my knees, but bearable – so a very big “thank you” to you and best regards from lively, summery Italy! Thank you for giving us such hope yesterday. It is one thing being told it is going to be ok when you do not feel it, but to see such an improvement was very uplifting. Thank you for being so professional and compassionate. Two years ago you operated on my foot with wonderful results. (I still do not run marathons though). You saved Michael from a spontaneous fracture last year and now we are even dreaming of skiing again in 2014!! We still have a bone marrow transplant ahead but we will get through it with the wisdom of good medical staff and a lot of prayer. And then we will come back next year for a report back. I’m so happy to be back home, being a new man, after a successful operation. My whole family, wife and children, were very happy to see these greatest improvements on their father and breadwinner in the family. Surely you have saved not only me, but quite a number who are dependent on me. Jason the purpose of this letter is to thank you very much for all what you did (i.e. getting the op done and convincing all whom you worked with on the prevalent financial problems). Surely without you this could not have been a success. The hospital became a good place to be because of your love, kindness, motivation, encouragement, and above all your expertise. Your tireless visits to my bed kept me on the rails to recovery. I won’t forget Rebecca, her friendliness and encouragement, please thank her for me as well. I have written letters as well all who have assisted in a way or other – Dr G Lloyd, Dr Dorfman, Dr R Poole, Mr Kevan Seaman (Hospital manager), and Mrs Sally Tomlinson (from Smith and Nephew prosthetics) all I won’t forget. They fought like ants. The world would be a very nice place to be if all people were like you – surely hats off. I’m still doing the exercises as said by the physiotherapist. I’m really improving day in day out and your words are becoming a reality (that you want to see me moving like any person). This has also shocked many of my workmates who couldn’t believe these developments. I will continuously inform you, through sms, on any and every development. Jason I really wish so from my entire family once more, thank you very much! I really hope to meet you once again in life in good health. Question/Complaint: My experience with doctor Crane has been a different experience to that of other doctors. He has an ability to build a special repore, more human like than other experiences. The time and effort he takes to listen with so much empathy. His work is good and he certainly knows what he is talking about. His staff are professional and super efficient. The journey with this practice has been great. I want to say thank-you for the excellent work you performed in fixing my broken 5th metatarsal in January. As you well know it was rather a bad break and as someone who enjoys running I was worried how this may affect me down the line. I am very happy to say that by the end of February I was walking without crutches and ran in the Lighthouse 10km run on the 7th March in a time of 43minutes. The only thing slowing me down was my lack of fitness and not my foot. I couldn't have asked for a better operation and wanted to take this opportunity to say thank you for performing such skilled work and taking care of me.